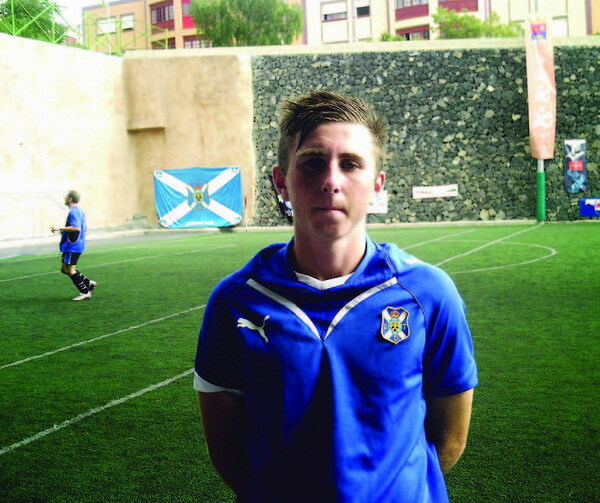 Billy Ions is a 15 year old British centre forward lad now playing with the CD Ten­erife Cadetes. 02.01.2010 - Chris Todd: How did you get snapped up by CD Tenerife? Billy Ions: I was playing for the Tenerife South Selection and I was spotted by a scout at the match. Three of us playing that day were asked to sign up with CD Tenerife. As far as I am aware I am the first ever ex-pat to make the grade at my age. CT: How many times to do you train each week? BI: We train four times per week at the Tenerife training camp at Geneto near to La Laguna. There are four full size pitches, one grass and three artificial. The club pro­vides a free mini-bus service for all the youth players from the South of the Island for the 100 mile round trip. CT: Have you had any trials with other clubs? BI: Yes; Sunderland, Man.Utd and West Bromwich Albion. CT: What are your strong points? BI: Strength on the ball and power of shot. BI: I need to practice more with my left foot. Also to keep training hard in order to accomplish my ambition to become a professional footballer. CT: How do you rate the standard of football in your league, the Preferente Cadete Tenerife? BI: To be honest there are five competitive teams out of the twenty in the league. CD Tenerife often win by six or seven goals as you may ex­pect as the best young play­ers in theory should end up at the Island’s main club. We have scored 93 goals in our 14 matches this season. The best win was a 13-0 demoli­tion of El Médano. CT: So are you running away with the league? BI: No, but we are currently four points clear of Aguilas Atletico from Adeje who are followed closely by Laguna and UD Ibarra from El Fraile. CT: Club supported as boy? CT: Who are your football­ing heroes? BI: Alan Shearer and Fernando Torres. CT: Biggest influence on your career so far? BI: My father. He has been known to play a bit himself! CT: Which player in world football today would you like to play alongside? CT: What player would you compare yourself to? CT: If you make it through the ranks of CD Tenerife where would you most like to score your first goal? BI: That would be easy. At a Real Madrid v Tenerife game in front of 80,000 in the Bernabeu. CT: Where do you expect CD Tenerife Cadete (U-16) to finish this season? BI: I am very confident that we will win the champion­ship. Billy’s first match of the New Year will be a tough match against CD Marino in Las Américas on Sunday Jan 10th. Check www.futbol­me.com for kick off details. Search for “Cadete” then scroll down for “Preferente Cadete Tenerife”. Thanks Billy and good luck for the future!